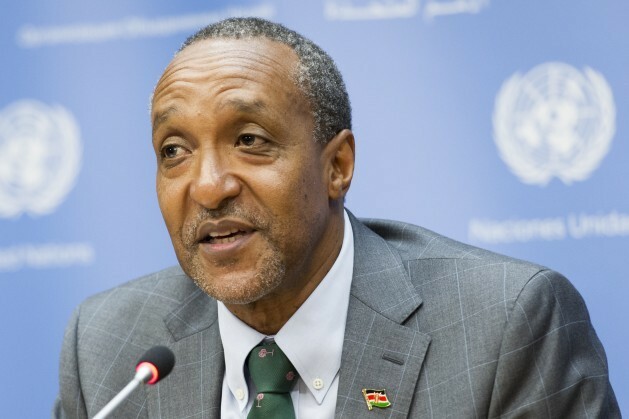 Macharia Kamau is Kenya's Permanent Representative to the United Nations. UN Photo/Mark Garten. UNITED NATIONS, Mar 12 2017 (IPS) - The Super El Nino of 2015 to 2016 wrought droughts and floods around the world, yet it is its sister La Nina that is now fuelling drought and hunger in East Africa. IPS spoke with Macharia Kamau, Kenya’s Permanent Representative to the United Nations and an expert on climate change and El Nino and La Nina. “Climatic events have taken on a rather different pattern now because of climate change,” said Kamau. “We estimate about two million people have been affected,” said Kamau. Those most at risk of malnutrition include the elderly, young children and mothers who are breastfeeding, he said. With two-thirds of its landmass already desert or semi-desert, Kamau says that Kenya is already vulnerable to low rain-fall. However less reliable weather patterns associated with climate change, as well as increasingly frequent La Ninas and El Ninos, mean that farmers now have less time to recover in between extreme weather events, such as droughts and floods. “If you’re relying on rain-fed agriculture, then having the right weather, predictable weather, is crucially important,” said Kamau, who is also the Special Envoy of the President of the UN General Assembly on Climate Change and was formerly the Special Envoy to the UN Secretary-General on El Niño, alongside former President of Ireland, Mary Robinson. Yet it is not just people who cannot find enough water. During droughts Kenya’s pastoralists struggle to find enough water for their cows. While the government is helping relocate some livestock, the lack of rain places incredible strain on farmers. Wild animals also struggle to find enough food during droughts. The International Fund for Animal Welfare estimates that some 40 percent of the animals in the Tsavo West National Park during Kenya’s last severe drought. Droughts has a “direct impact” on Kenya’s tourism industry which relies on visitors to its wildlife reserves, says Kamau. Climate change is also affecting the East African coral reef, another important part of Kenya’s tourism industry. “That’s another worrying situation,” said Kamau. The recent La Nina which subsided in February follows the super El Nino of 2015 to 2016, one of the most severe El Ninos on record. Climate change is making El Ninos and La Ninas more frequent and more intense. Although La Nina has subsided, Kamau doesn’t think that there will be much relief until at least April. “If you are already without food or water for a couple of months and living off of disaster assistance, a week is a lifetime,” he said.